This stunning British Impressionist oil painting is by important Jewish female artist and Suffrage activist Lily Delissa Joseph. She was the sister of the famous portrait painter Solomon Joseph Solomon who encouraged her to develop her talent as an artist. This painting was exhibited at the Royal Academy London in 1922, No. 48 and entitled A View in the National Gallery. Joseph exhibited profusely at the RA between 1905 and 1938. 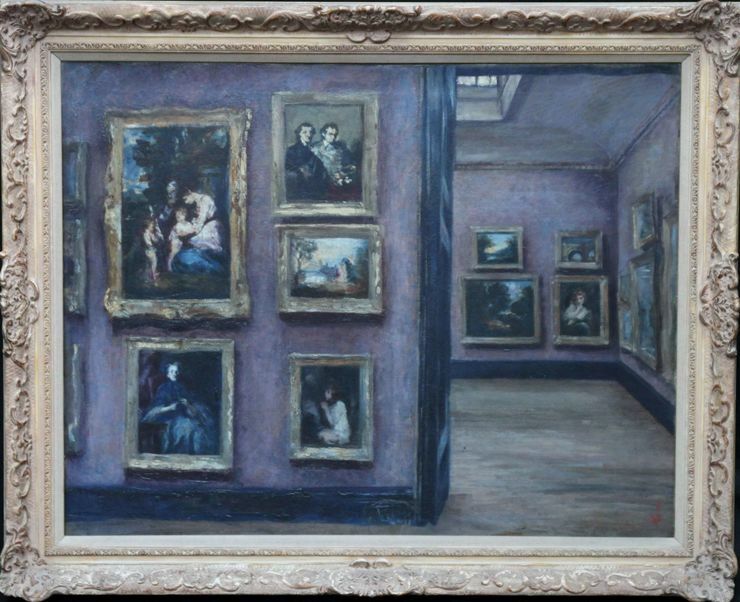 Our painting depicts an interior view of one of the National galleries, showing numerous portraits and landscapes on a purple background. The Impressionist palette of muted tones is stunning and Joseph captures this interior view to perfection. Joseph may have been making a statement about the lack of female artists exhibited in the national gallery around that time. The Guerrilla Girls, an anonymous group of feminist female artists, formed in 1985 in New York, devoted to fighting sexism and racism within the art world, would be proud of her. For her 1912 exhibition at the Baille Gallery, Joseph was noted absent from the show's Private View reception on the grounds that "she was detained at Holloway Goal in connection with the Women's Suffrage Movement". Signed with initial lower right. Exhibited at the Royal Academy London in 1922, No. 48 and entitled A View in the National Gallery. London collection. Housed in an ornate frame, 46 inches by 38 inches and in good condition. Lily Delissa Joseph, née Solomon, (1863 – 1940) was a British artist and social campaigner active in the English suffrage movement. Joseph was born in Bermondsey in London into a wealthy, cultured Jewish family. Her elder brother was the artist Solomon Joseph Solomon, and Flora Lion would be a cousin. Joseph attended the Ridley School of Art and the Royal College of Art in London. She painted portraits, interiors and urban landscapes in a style clearly influenced by Impressionism but often with a limited palette. Joseph was also an activist in both the women's suffrage movement and in support of Jewish charities. She was among the founders of the Ladies' Guild at the Hammersmith Synagogue in west London and also ran reading rooms in the Whitechapel area. After meeting Isaac Rosenberg in 1911, she helped pay for his studies at the Slade School of Art. Joseph was arrested at least once during the women's suffrage campaign. When her 1912 exhibition at the Baille Gallery, Some London and Country Interiors, was reviewed in the Jewish Chronicle a notice appeared on the same page apologising for her absence from the show's Private View reception on the grounds that "she was detained at Holloway Goal in connection with the Women's Suffrage Movement". In 1924, Joseph and her architect husband held a joint exhibition of drawings and paintings at the Suffolk Street Galleries. Throughout her life Joseph was a regular exhibitor at the Royal Academy, showing some twenty-five paintings between 1904 and 1938. 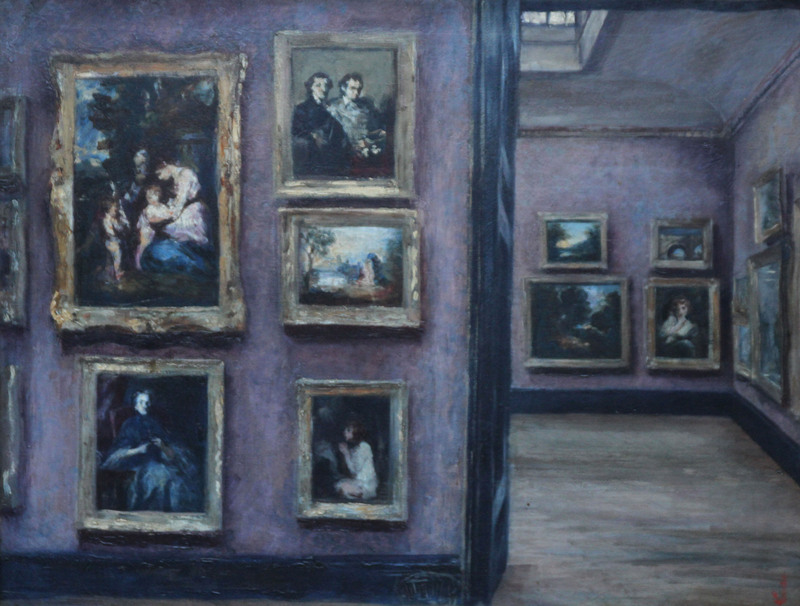 She also exhibited with the Society of Women Artists, the New English Art Club and the Royal Society of British Artists. Joseph exhibited at the Paris Salon receiving an Honourable Mention on one occasion and in 1929 winning a silver medal. In 1946 the Ben Uri Gallery in London had a joint exhibition of works by Joseph and her brother Solomon and examples of her paintings were included in the Jewish Art of Great Britain 1845–1945 exhibition held at the Belgrave Gallery in 1978. The Ben Uri Gallery holds her Self-Portrait with Candles which shows Joseph holding two Sabbath candles and with her head covered observing the Jewish Sabbath. The Tate collection includes a 1937 London scene by Joseph, Roofs, High Holborn, showing the view from her studio towards the Old Bailey.